Therefore, I watched Rubber last night. 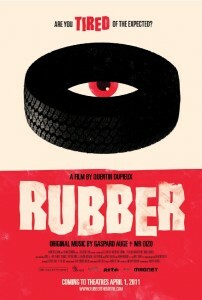 Rubber is a horror movie about a tire that rolls around the desert, killing people. No, seriously. It’s somehow a great deal more than that, though. See, there’s a monologuing sheriff, a Greek chorus of sorts, a sometimes naked French lady, and metareferentiality that goes so deep it actually turns inside out on itself. If you liked carrying around no tea for the duration of the Hitchhiker’s Guide to the Galaxy Infocom game, or if you like absurdity for its own sake, or if you like watching things explode, this movie is for you. If you would spend the entire movie asking why there’s a tire with motivations and psychokinetic powers in the first place, this movie will try very hard to be for you anyway. If you let it. It’s an 80 minute flick that felt like it lasted less than an hour, though, and I mean that as a compliment. So maybe give it a try? This entry was posted in Film and tagged comedy, horror, Netflix on November 28, 2014 by Chris. So, I finally reached the point I’ve been anticipating for like four books? Five? Years, anyway. All Out War (part 2) does not have a part three. Storyline resolved. For all that it matters, it was resolved satisfactorily, with clever turns, expected, unexpected, and subverted. I am quite satisfied with this book. I am far less satisfied with the fact that another book will follow it. (In fact, already has. This is the kind of behind I fall when I’m not allowed to read for two plus months.) 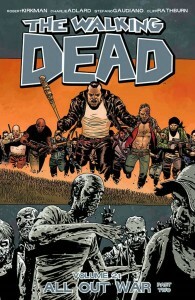 I hope I’ll find out I’m wrong, since I know I will find out, but I really doubt that Kirkman has new stories to tell. And I can’t even comfort myself by saying of course he had to write more, this one ended so terribly. Because, nope, wind or not, this was an ending. …could have been, anyway. 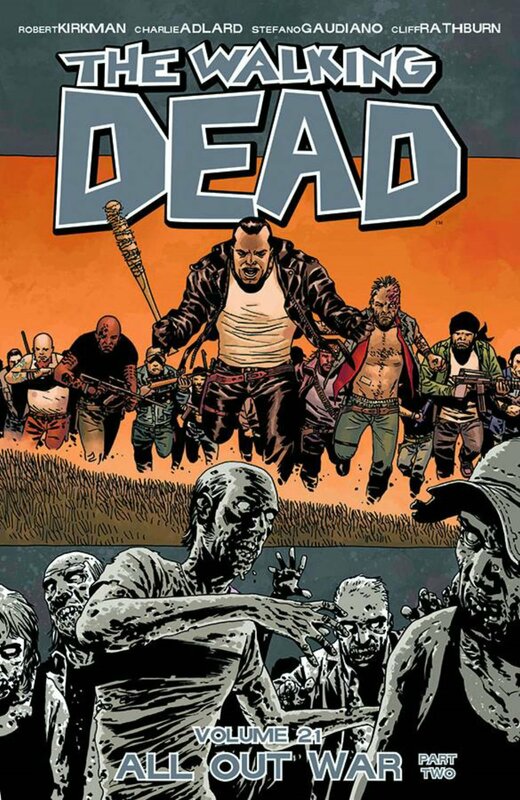 This entry was posted in Words and tagged graphic novel, horror on November 28, 2014 by Chris. The newest wave of Ultimate books is finally here! Which is to say, they dropped within a week or so of the site coming back up, and despite there being three of them already, that’s just a timing issue and I’m not nearly as far behind as it sounds. Unlike if you were to be talking about Brust or Rothfuss or King or Butcher, to name a few twitches I’ve had lately. Strangest Ever is certainly a book that lives up to its title. 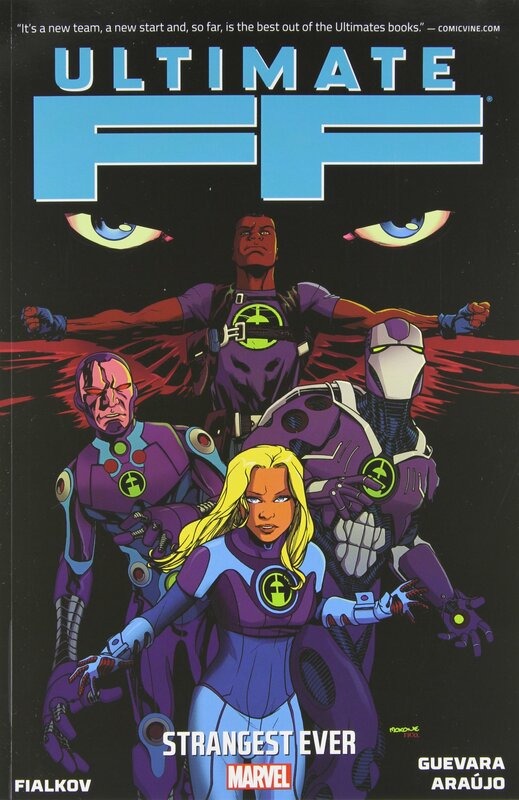 It’s not the Fantastic Four like you’d think (unless you’ve been following these plotlines, in which case you’d think that’s entirely ridiculous). 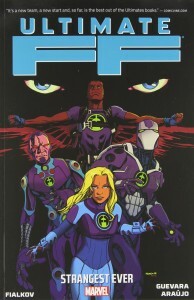 Instead, it’s the Future Foundation, which is basically Tony Stark’s and Sue Storm’s brainchild to defend the planet against extra-dimensional incursions of the type that came so close to wiping out all life, a book or so ago. And that’s a good idea, as far as it goes. It’s just that it seemed to turn into an excuse to trot out every bizarre event that has ever happened in the Marvel multiverse. It turns out I have limits? But that’s a matter of taste, which I accept. It’s not objective truth, like the fact that nobody wants to see a purple Iron Man. And it’s not something that clearly should be objective truth, like that nobody wants to see dead people come back. The whole Ultimate thing up until now has been so good about that, and okay, they had a really good excuse this time. They earn credit with me for not having used, much less overused, this excuse. But the reason why they have that credit is that they don’t do it. The whole thing makes me skeptical, is all I’m saying. Anyway, my point is this: I look forward to seeing someone take the reins on the new era soon, and I especially thank my stars that Bendis has stuck around. Someone give him the reins, yo. This entry was posted in Words and tagged graphic novel, Marvel, superheroes, Ultimate Series on November 20, 2014 by Chris. 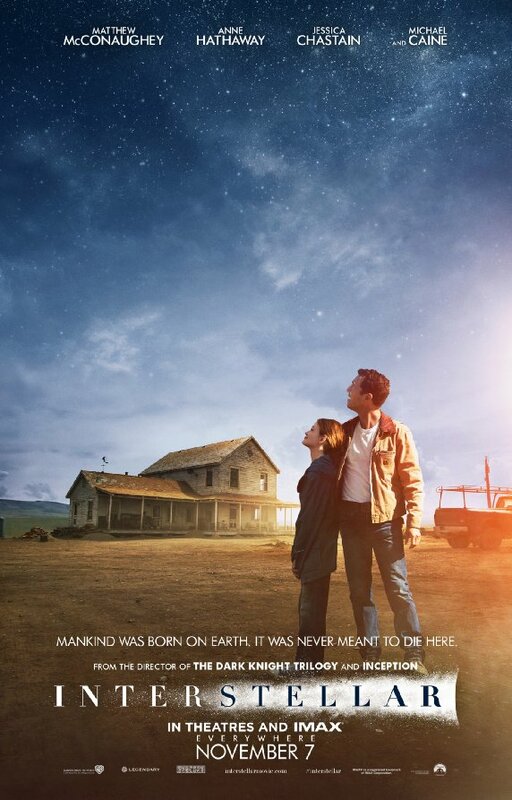 On Monday night, I took my father to see Interstellar. 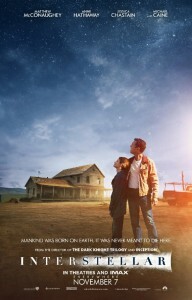 Accurate things gleanable from the previews are that it is a movie about mankind in her final hours, struggling to find an escape from a used up Earth, and that it is a movie about the tension between responsibility on small scale (family) and large scale (survival of the species), and that it is a movie about flying to Really Cool parts of space and showing Really Cool, Scientifically Factual things about those parts of space on the screen. So, y’know, it’s a science fiction movie. Cool. I usually, and imdb certainly did in this case, separate out my category tags by reserving sci-fi for movies and science fiction for books. But sometimes (Children of Men springs immediately to mind, as it often does when I’m thinking about things like this), when a movie goes to such great lengths to focus on our shared experience of humanity even though we should by rights be looking at really cool things in space? Well, my point is that I try very hard to make these tags usable, in case someone were to ever want to browse by them. And this was, like I said in the first paragraph, definitely a science fiction movie. And, dad? Thanks for staying. This entry was posted in Film and tagged science fiction on November 12, 2014 by Chris. 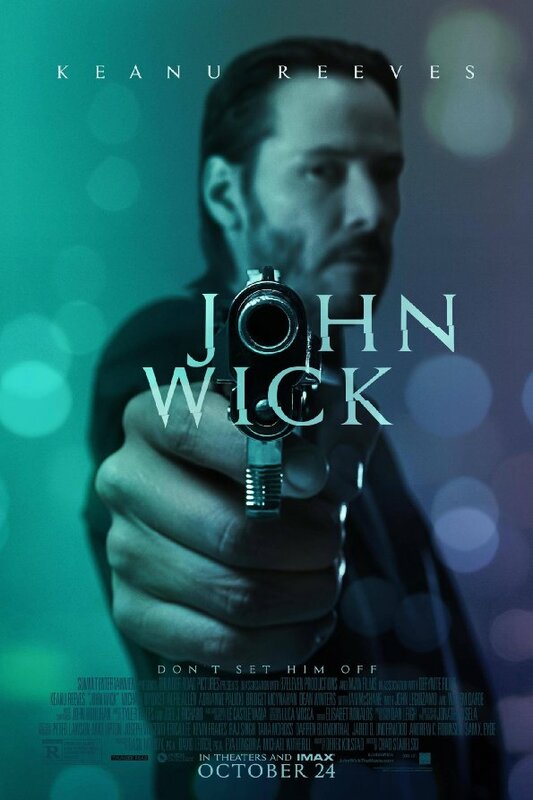 Ironically, I remember John Wick plenty well, since I only saw it like a week ago. Well, no, that’s not ironic at all. That was the premise for the actually ironic thing, which is how little I want to say about the movie. 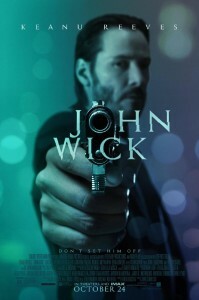 Partly this is because it’s a non-science-fictional action movie starring Keanu Reeves, and I think everyone on the planet has decided whether they are interested in that movie no matter what I have to say about it. But mostly it’s because this is the purest, least objectionable revenge movie ever made, and I don’t want to take anything away from the impact of that purity and clarity of focus by actually discussing it. So if you need catharsis for something? This might well work. Least objectionable motive for revenge, is what I mean to say. Obviously, objectionable things happen, not least among them the impetus. 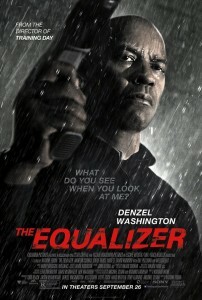 This entry was posted in Film and tagged action, thriller on November 12, 2014 by Chris. 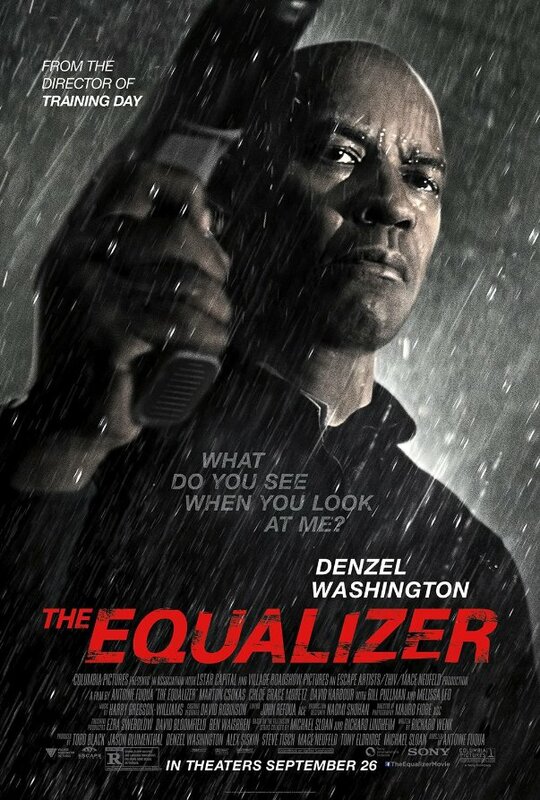 I know I saw The Equalizer before Myschievia, because I saw it the same day I bought my new canvas tent, which while not as waterproof as advertised, is far more waterproof than I have ever had a tent be in the past. Which is to say, more than a month ago. I’m kind of sad that this has to be one of the shoddy movie reviews I had mentioned earlier (in point of fact, I may have seen it before I finished reading the Stormlight book, they were within 24 hours of each other, but who can remember? ), because I had some thoughts about race and remakes while watching it that I no longer feel comfortable delving into, with the material no longer fresh in my mind. Something about the lack of black action heroes (well, since the ’70s anyway) and incorporating a comedy routine I heard sometime in that same time period but no longer remember the author of that discussed black remakes of what had been white movies, and the cultural shifts that occur and how this movie doesn’t really have that, but it’s all too vague and muddled in my head to feel particularly comfortable making a go at it. The problem with your website being down for two months is, you can’t remember what happened in between. I mean, no. 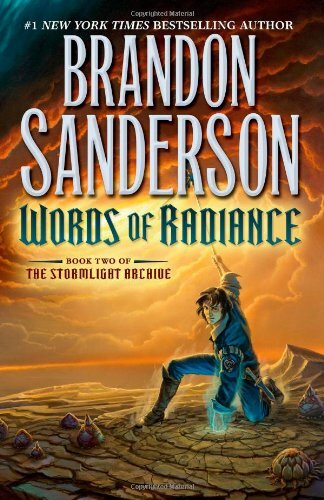 I’m fully aware that I thought Words of Radiance was a good book, that it did another good job of being largely self-contained, that it did a great job of throwing a lot of new information and a lot of really cool new magic- and world-building, that I stayed invested in the characters. So all in all, I still have the sense of the thing. But themes? Discussion of specific plot points I might want to put behind spoiler space? I sincerely got nothing. The good news is, I haven’t read any other books in the meantime, and I’m bound to read this again, so probably you’ll get a replacement review which will be good, someday? And more importantly, no other shoddy book reviews! Shoddy movie review(s? ), though? Probably. That’s not what I mean, but I don’t know how to pithily encapsulate what I do mean. Which is that I felt like it told a complete chapter within its larger story, and did not leave me feeling cheated out of getting more Right Now. In short, it’s doing a good job of maintaining its place in third-wave epic fantasy. This entry was posted in Words and tagged Cosmere, epic fantasy, The Stormlight Archive on November 11, 2014 by Chris.